Article about work policy of Broadway cinema. Article was published for the first time on June 22nd 2009. A few days ago, an article was published in the Croatian daily newspaper „Slobodna Dalmacija“ about a group of students from Split working at the „Broadway cinema“ who quit their jobs there and called for a boycott until they get payed. After the article was published, two activists of the MASA (Mreža anarhosindikalista/kinja/ Network of anarcho-syndicalists) local group contacted the student-workers on strike. Student-workers told them about their case, much more than what got mentioned in the article, about how that wasn't the first time they haven't got payed on time, nor was this the first time they raised their voice. While they were still working at the cinema, student-workers tried to reach the owners, Višnja and Gvozden Vidović, but it took them a long time to succeed at that. When and if they would manage to reach them, they would get no real answers, and one student was even told by Mrs. Vidović that she will get payed „if she behaves well“. After that they wrote a letter to the main office of „ISSA“ cinemas, in Zagreb, complaining about waiting for three months for their salaries. The response from Mrs. Vidović was that the management bears just a part of responsibility for the problem, and that it's the student's employing agency's fault because they didn't send all of student's contracts to her. She promised they will get payed „in a week.“ But they didn't, until, after another three months, student-workers warned the bosses they won't show up next day unless they get payed. Some got payed partially, some didn't. So one day they just stopped working. Management brought highchool student-workers in their place, who are now on their summer vacation and looking for a season job. Student-workers also told MASA activists about the negligence of the management, who don't pay their suppliers of snacks and drinks, and how there is no soap or toilet-paper in the rest-rooms because the supplier cut them off due to unpayed debts. Some film distributors refused to send them films because of back debt, so there were occasions when the workers had to face the full theater on a premiere evening, and tell the visitors to go back home. Also, one day a son of a worker furiously came to the cinema and held captive a supervisor and a student-worker, demanding his father gets payed immediately. Student-workers don't believe the owners when they say there's no money to pay them. They believe that the money of the firm is transferred to their private accounts, which they then use for personal luxuries, such as a yacht Gvozden Vidović bought last year at Split Boat Show, or their trip to Monte Carlo to see the race, etc. Vidović couple, say the student-workers, are paying 400 euros a month for an apartment in Split that they use few days a year. Similar experiences are reported by Tomislav, Igor and Marko, whit whom the MASA activists from Zagreb local group did an interview yesterday. 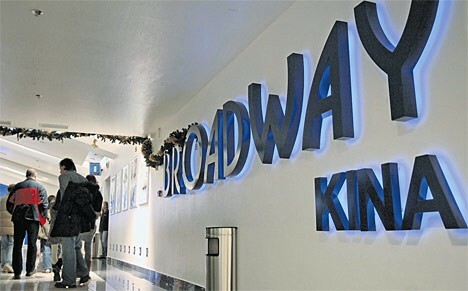 They had been working in the Broadway Zagreb multiplex until it closed in March 2008. The money for their salaries was transfered to owners' private accounts, to be used for their then newly-founded cinema in Split. Tomislav says that he heard from an ex employee of Zagreb Broadway that, at that time, Mr. Vidović bought himself a new Porsche. They speak of working overtime without pay (while being criticized they work too little), being called to work earlier, because of unplanned shows... Delays in pay happened often and took a long time, with Vidović unreachable and unresponsive. They decided to strike, not coming to work, and the owners started pressuring the supervisors to establish discipline again. When that didn't work, they tried to operate the cinema themselves, and their son came to help, but they couldn't do it, and had to cancel the shows „due to technical problems“. The Broadway in Zagreb eventually got closed, and Vidović told them there will be money, giving them the phone number of Mrs. Adela, the accountant. They waited and called her every week asking about the paycheck, but they never got it. Vidović owns them 2500-3000 kuna each, which is about a Croatian monthly minimum wage. And, judging by his policy towards the workers, he is not planning to, because he pays only when is pressed to do so. Adding to these stories, let us remember last summer, when the anti-worker policy of this firm got in the public. Petar S., member of MASA, asked his organization for help when he didn't get payed after a legal deadline for his one month work. Split local group of MASA organized a direct action, picketing and spreading leaflets in front of the cinema, calling for boycott. The very next day, the total amount sat on Petar's bank account. What can be concluded at the end of all that's been written? At the first and the shallowest look, one can see a injustice done by a firm to specific student-workers. It is not, as we could see, an one-time error, but a constant policy since, according to what we have found out, at least to 2005. But, on a level greater then this specific case, numerous questions can be raised, that are unnoticed or neglected by dominant public – neoliberal – media discourse. We deliberately used the expression „student-worker“, primarily because we wanted to point to students as a source of work force that has quite a role in reproduction of capital, and is at the same time, underestimated, underpayed, or even unacknowledged as such source at all. Student-workers are actually an example of „precarious work“, that is a growing trend (the trend is often called casualisation) in the West, and so is in the trendy Croatia. Precarious work can be found mostly in the third sector, or the service sector, and is characterized by the work uncertainty (short term work contracts), impracticability of organizing a union, fear of getting fired, and no benefits. Although this story is focused only at only one firm, we see it not as an isolated case, but as a coming structural relation between work and capital, which, in the economy based on profit instead on human needs, are divided and in struggle. This is not a story about a „hick“ with no manners who doesn't know how to run business and has no respect for his employees, but an example of behavior implicit to capitalism – exploitation of work. But the students from Split decided to come out of silence of their exploitation, and to fight for their rights. That action, among other things, encouraged their colleagues in Zagreb to talk about their case to the public : „I admire those young people for standing up to injustice, and I regret we hadn't done what they are doing“, said Igor. But maybe it's not too late, maybe they can gather and win what is their together. Maybe there is a chance that society at large, as a necessary factor for the success of such actions, acknowledges this specific fight and solidarizes with them? Because great things start from little actions! Workers in Croatian cinemas are not unique in having to deal with blunt exploitation. In Germany there is a struggle going on for months, where the workers of Babylon cinema fight for their salaries and better working conditions. However, the workers there decided to get organized in a union, so they joined the anarcho-syndicalist Freie ArbeiterInnen (Free Workers)Union. Till now, 25 % of worker joined, and they have a support from majority of workers. For more information, see their blog. Croatia: Solidarity with shipyard workers!